We are dedicated to delivering quality service on a timely basis to every client, every time. 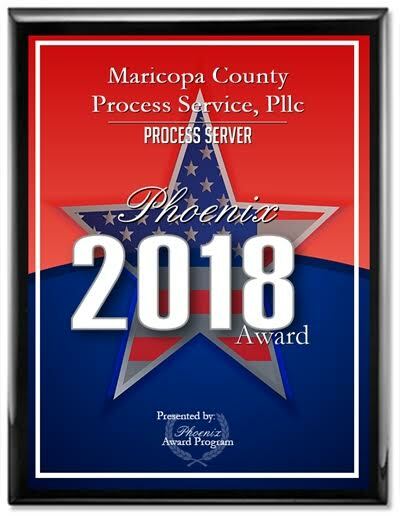 Maricopa County Process Service, PLLC is dedicated to achieving quality service on a timely basis. Our professional process servers live throughout Maricopa, Pinal and Pima Counties. This allows all our serves to become local serves. Serves are made during the day, evenings and weekends. We schedule our attempts to better connect with the person or persons being served. With over 30 years of business experience, we understand the importance of customer service and communication. We use Process Server’s Toolbox Web Services Pack to monitor all jobs and provide email updates to you on the progress of your jobs. We provide timely service of process as well as proof of service. We are members in good standing with NAPPS (National Association of Professional Process Servers). We are past members of APSA (Arizona Process Servers Association), CALSPro (California Association of Legal Support Professionals), and TPSA (Texas Process Servers Association). With Maricopa County Process Service, PLLC on your side, you can rest assured that your legal papers are being served properly. We carry a $1M errors and omissions and $2M general liability policy. To learn more, see us on YouTube. Maricopa County Process Service serves throughout the state of Arizona. Our servers cover all of Maricopa, Pima and Pinal counties, which includes 5.2M of the states 6.7M residents. Because we are using our own servers we are able to offer a guaranteed flat fee. We do support all counties throughout the state through our network of servers. In those cases the fees can vary, however, a guaranteed flat fee will be quoted prior to service. Once service has been completed we file all affidavits of service in Arizona courts. Do you have an evasive person to be served process? Have they "skipped" town? We will locate your missing person through public records and database research, social media searches, and reaching out to neighbors and family members and serve them the legal papers once we find them. Maricopa County Process Service offers skip trace services, however, we must have a case number and be responsible for the service of process. We forward process throughout the country on a daily basis. Many of the servers we partner with are members of NAPPS (National Association of Professional Process Servers.) When we post a job, multiple companies submit their best (wholesale) price to us. We then add a modest administrative fee and manage the job. When possible we partner with companies that use the same software we use so we can receive real-time updates. Call for a price quote. Need to serve a Notice of Claim? We have the staff to assist you in getting your notice of claims served before the deadline. We are experienced in serving government agencies and law enforcement personnel. Our Statutory and/or Registered Agent Services are conducted by our management company, MCPS Management, LLC. The purpose of an Arizona Statutory Agent is to provide a legal, physical address where someone is available during normal business hours to accept legal service of process. In addition, government agencies can send official documents required each year for tax and legal purposes, such as tax notices and annual report notices. The state of Arizona requires that every corporation and limited liability company retain and maintain an in-state statutory agent.The terms "statutory agent, resident agent and registered agent" are interchangeable. Our fees for Arizona Statutory Agent Service are: $149.00 for 1 year; $125.00 per year for 2 years or $100.00 per year for 3 years. Please click on the Statutory Agent Link and follow the directions to establish MCPS Management, LLC as your statutory agent. MCPS is one of the best companies that I have dealt with. The owners and staff are always professional, prompt and up to date regarding legal process. If you are looking for an honest process serving company that offers a fair price and quality service, Maricopa County Process Service is the company to choose. Greg and his team at Maricopa County Process Service are professional and competent. They do good work under normal circumstances and when there's a difficult service issue, they do great work. I have recommended them to other lawyers and will do so again. MCPS has consistently provided me with prompt and effective services. They have been excellent to work with and very responsive to my clients needs. Our organization has a back office support staff to ensure timely affidavits of service. No hidden cost (no mileage or notary charges.) We offer a flat fee for our services. Call (602) 424-7474 today for legal services or fill out our contact form and a member of our staff will get back to you right away! © Copyright Maricopa County Process Service, PLLC. All rights reserved.